Given the freezing weather, unsurprisingly, fishing has been slow this week and, on some days, impossible. The lake was partially frozen but some anglers braved the conditions and nearly all caught in the low single digits. Buzzers, Snakes, Damsels and Bloodworms seemed to be the best methods. Temperatures set to be better this week and as of now, the lake is completely fishable with no ice. Updating Facebook page and website with daily reports to keep news current. The TEFF bank match is on February 24, looking forward to seeing some sea-soned anglers at this event. Blackdyke’s Troutmasters fish-off is on April 7 so please do let them know if you will be attending. Next restock will be mid-February. Elinor opens for the 2019 season this Saturday February 9 at 7am. All prices remain the same as 2018. Prospects are the best for four years with no flooding. The water level is less than a foot off full and gin clear. The preseason stocking of 1550 fish included a good proportion of 4lb+ specimens. There is no need to book for bank fishing but it’s best to book boats, especially from April onwards. Hoping you enjoy a memorable season. After the ice last week preventing fishing, this week, the lakes are open 7 days a week. Sport has been mixed with some anglers getting good catches of 10 fish and others getting 1 or 2. Best methods are nymphs, especially Diawl Bachs, either two on a cast freelined, or fished under an indicator. In windier conditions an intermediate line with a Cat’s Whisker, or Minkie is working well. The fish are high in the water so the best sinking line is an intermediate. 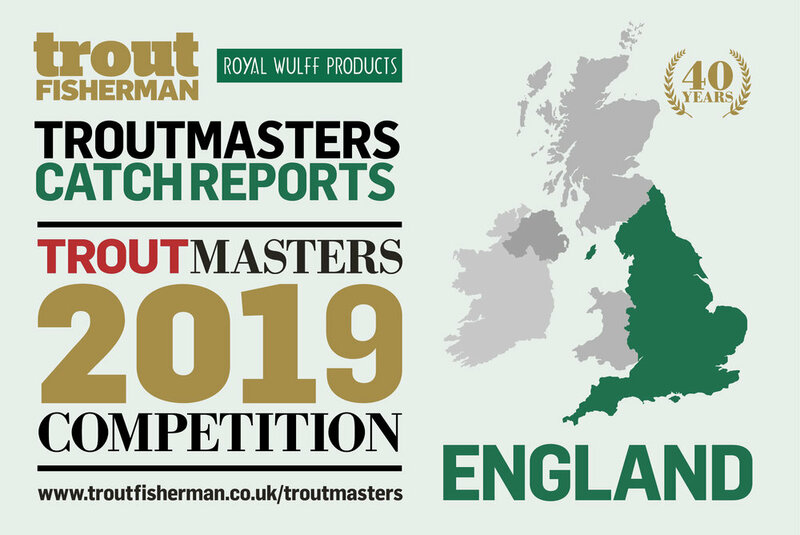 Last week saw the Angling Trust England Qualifier fished at Press Manor and 14 anglers braved 50mph winds to fish for a day with good catches. Some anglers travelled from Northumberland and others as far South as Essex, in order to com-pete. Continuous cold winds, some hard frosts and heavy snow haven't made it easy for the anglers this week, however the colder conditions have allowed some of the larger fish to be slightly more active. The aerators have continued to keep both Long Crag and Coe Crag mostly ice free. The heavy snow that arrived at the end of the week caused some disruption, making it unsafe for anglers to fish. Various lures and nymphs have proved successful. Jordan Lisle had a 'cold' 6-hour ses-sion, safely releasing 6 fish to Long Crag using a Pink Blob. J. Riddicks from Maybole had a 'great day' landing 6 fish from Coe Crag using a Green Fritz. Cramlington angler, Alec Harvey also had a productive 6 hours, landing 8 fish between both lakes using Apps’ Worms. Mick Brown from Bedlington used Buzzers to safely release 5 fish to Long Crag. Matty Devine from Hadston landed 16 fish between both lakes using Diawl Bachs and a Devine Dancer. Matty's best fish was estimat-ed at 10lb. J. Harrison used a Cormorant to safely release 4 fish to Coe Crag having a 'good day'. Newbiggin angler, Willie Emery landed 4 fish from Coe Crag using Apps’ Worms. Best flies are Apps’ Worms, Blobs, Buzzers, Cormorants, Diawl Bachs and various lures. Long Crag will be closed on February 16 for a TEFF Fundraising Com-petition. To book a place please contact the Fishery on 01665 574400. Coe Crag will remain open as usual. Apologies for any inconvenience to our regular anglers. Fishery open daily 8.30am to 4pm. George Burton, from Ashington, landed this nice 5lb rainbow from Long Crag Lake at Thrunton fishery using a Cat's Whisker. A week of good results even as the temperatures dropped considerably. On Sunday there was partial ice cover in areas of the lake with a thaw late morning. Bloodworms, Cat’s Whiskers and Buzzers are the best methods, as they have been consistently for some time. Most anglers had 4 or 5 fish during the week. Next restock is mid-February with the TEFF Bank Match on February 24. The Troutmasters fish-off date has been set as April 7. As Blackdyke is a Troutmaster member, please remember to participate during the year, forms in the fishing lodge. A quiet week with strong winds at the beginning; snow in the middle and hard frosts at the end. The aerators have so far managed to keep the lakes virtually ice-free and anglers who braved the wintry chills have still managed to land some good sport. Diawl Bachs and Bloodworms have continued to produce some good bags, and a few of the determined anglers managed to tempt some fish up to small dries like Shipman’s. Some of The Oddfellows Angling Group visited Thrunton this week, with most members casting their first line of 2019. Top rods were Jaime Scott and Jason Clarke, both from Alnwick. Matty Devine managed 5 fish to 7lb on Long Crag using Diawl Bachs. Les Dinsmore from Cramligton released 9 on Coe Crag using Cat’s Whiskers. G. Lynn from Chopwell returned 7 to Coe Crag using lures. Steve Noble from Linton released 5 fish on Buzzers on Long Crag. Mick Brown from Bedlington released 17 over both lakes having a ‘terrific’ day using Buzzers. Ray Wood from West Woodburn returned 7 to Coe Crag using Apps’ Bloodworms. Josh Piper from Pegswood returned 5 to Long Crag and 9 to Coe Crag using Diawl Bachs, Apps’ Worms and dries. His best fish was estimated at 6lb. John Barnes from Guidepost returned 7 to Coe Crag on various flies. Morpeth angler John Williams safely returned 9 fish using Diawl Bachs during his 4-hour session. Trevor Wadds from Longframlington released 10 fish over his two visits using Diawl Bachs and Bloodworms. Howard Croston from Morpeth had a ‘nice day’ landing 9 fish from Coe Crag using Diawl Bachs and Bloodworms. David Kay, also from Morpeth, used lures to safely release 9 fish to Coe Crag, he also landed a lovely double-figure rainbow. Peter Crowe landed 9 fish from Long Crag during his 5-hour session. Best patterns are Diawl Bachs, Buzzers, Shipman’s, Bloodworms and Cat’s Whiskers. Fishery open daily 8.30am to 4pm. England Bank Team Fundraiser - on February 16, 2019, Thrunton will be holding a competition helping to raise some money for the England Bank Fly Fishing Team. To book a place please contact the Fishery on 01665 574400. A good week’s fishing even though footfall was quiet. Fish are well distributed, with all sides of the lake yielding results. Best method: Cat’s Whiskers, Bloodworms, white lures, Blobs and Damsels off the top to 4 feet down with a slow retrieve. Gordon Curtis caught 13 fish on Saturday on a half day ticket using Cat’s Whiskers and Bloodworms. Next restock will be mid-February. Spaces still available for the TEFF Bank Match on February 24. See Blackdyke’s website for details. The Lakes are fully stocked with fighting fish and we look forward to welcoming you to Tenterden for some great fishing this year. We have our cosy new Fishing Lodge on the side of Lake 1 to make your visit more enjoyable. We hope to see you soon and thank you for your support throughout 2018. A period of varying temperatures has put the fish down a bit this week with lures such as the Apps’ Bloodworm counting for most fish caught. However, some fish are still showing interest in dries on milder days with one angler landing 5 on dries and missing just as many. Strong winds during the latter part of the week made fishing conditions even harder, some anglers still managed some bag numbers and some double figured fish. Trevor Wadds from Longframlington netted 24 fish over 2 visits this week from Long Crag; Trevor used Blobs, Bloodworms, Eggstacy worms and Diawl Bachs. Duncan Passmore from Ponteland safely released 6 fish to Long Crag with Bloodworms and Buzzers. Jim Burtle from Newcastle netted 7 fish over both lakes using various flies. Wayne Haddon released 6 fish on Coe Crag using Apps’ Worms. Alan Morton from Gosforth returned 7 over both lakes with Fluff Cats. Steve Noble from Linton released 5 using dry flies on Long Crag. Mick Brown had a ‘canny day’ returning 15 to Long Crag using ‘Looaz’ during his 7-hour session. Steve Henderson from Rowlands Gill released 7 fish between both lakes using Tinnies. Peter Crowe landed 9 fish from Long Crag during his 5-hour session. E. Craster safely returned 6 fish to Long Crag also during his 5-hour session. Davy Kay from Morpeth released 6 fish to Coe Crag using lures and Blobs. Fishing instructor Bob Smith, from Morpeth, landed a lovely 15lb rainbow from Long Crag using a Buzzer. Top flies this week have been Bloodworms, Blobs, Diawl Bachs, dries, Buzzers, Fluff Cats and various other lures. 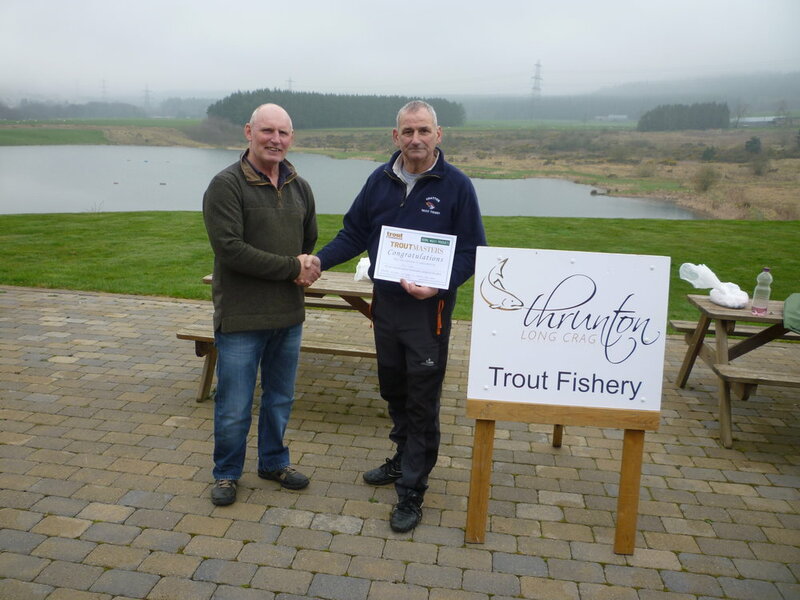 England Bank Team Fundraiser - On February 16, 2019, Thrunton will be holding a competition helping to raise some money for the England Bank Fly Fishing Team. To book a place please contact the Fishery on 01665 574400. Open daily 8.30am to 4pm.